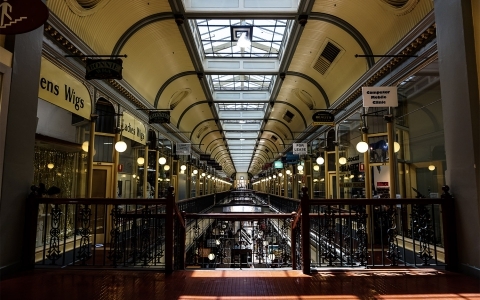 The small, former mining community of Kapunda is commonly referred to as the most haunted town in Australia. 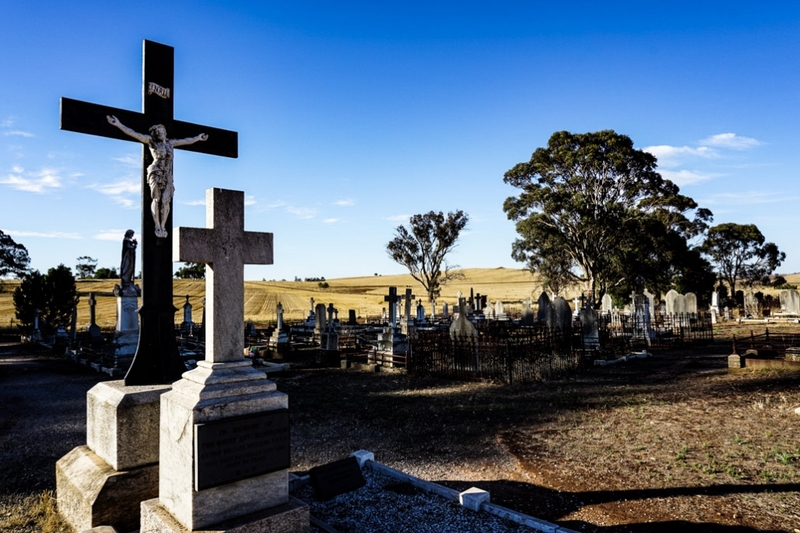 It holds what is likely to be South Australia’s best known cemetery, which happens to be surrounded by some extremely sinister rhetoric. 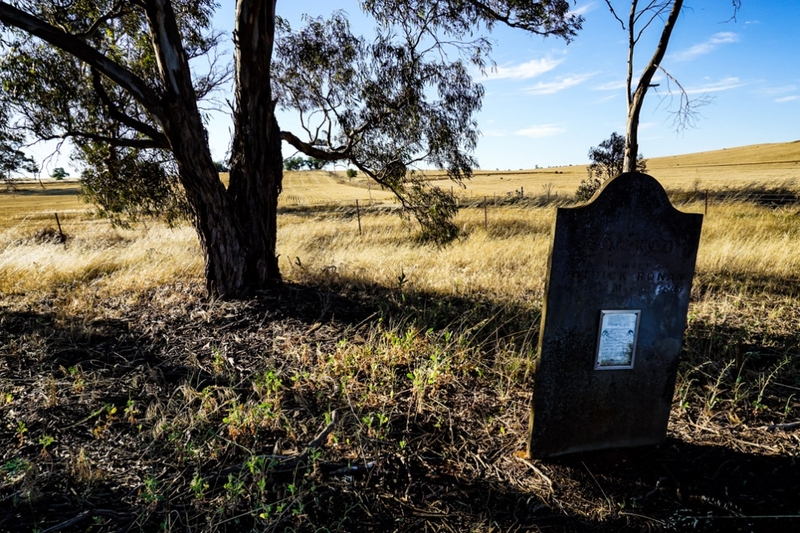 Graves within Kapunda’s supposedly haunted St. Johns Cemetery. This cemetery was once overlooked by St. Johns Church and a Presbytery, built in 1854. The Presbytery became a school in 1869 and later a reformatory for young girls, who had committed minor criminal offenses, before closing in 1909. The area’s negative image has been perpetrated by local folklore and a controversial documentary, which circulated many untruthful stories to a wide population. Since then, vandalism, trespassing and general safety concerns resulted in the church and former reformatory’s ruins removal. The St. Johns Cemetery, formed in 1861, still remains and has taken the spotlight for many insidious ghost stories. Me standing in front of the hill where the St. Johns Church and reformatory once stood overlooking the cemetery. 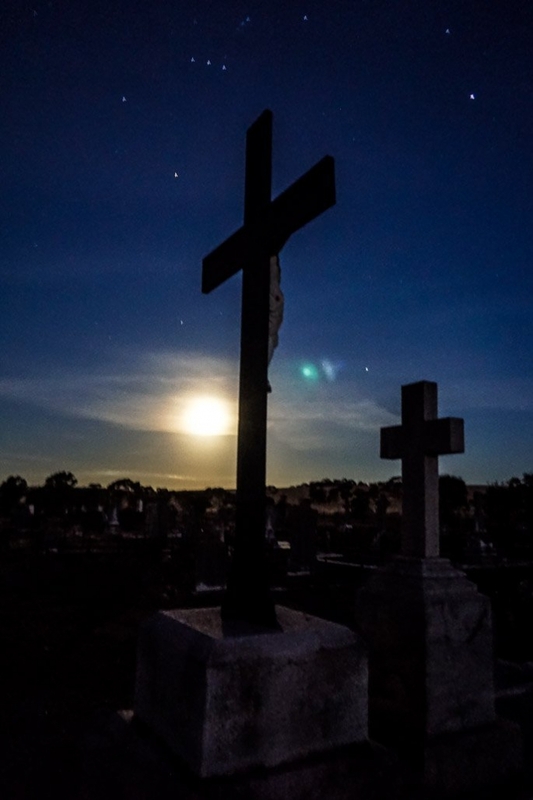 Historians and many individuals within the paranormal community have worked to dispel myths surrounding the St. Johns Cemetery within Kapunda. Although, still a favorite location for ghost seekers and possibly haunted, many of the ghost stories plaguing the cemetery are historically inaccurate. 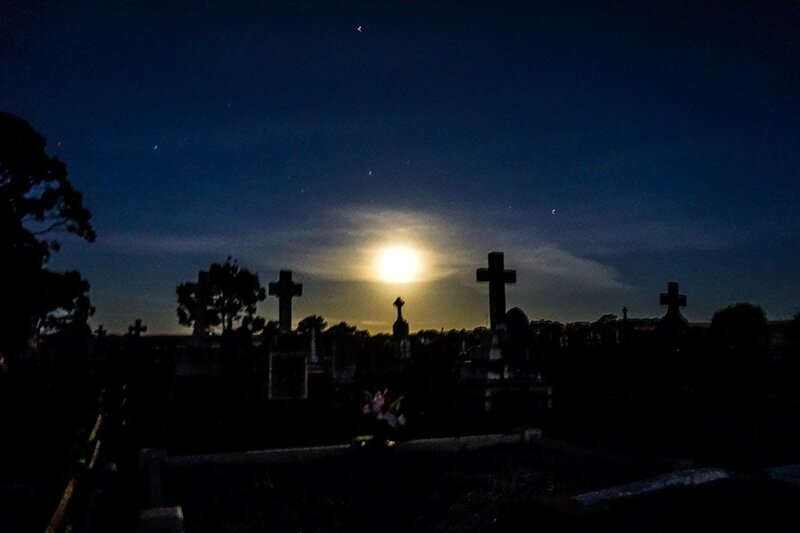 Full moon shining down on the haunted St. Johns Cemetery below. One of the most cited stories is that of a young girl named Ruby Bland. Rumor spread that Ruby fell pregnant after being raped by the resident priest during her stay at the reformatory. In order to cover up this terrible sin, the priest attempted to perform an abortion on Ruby, killing her and the unborn child in the process and then burying them in the St. Johns Cemetery. This story is not based on fact. It is known that Ruby did exist and died in hospital after the reformatory had closed. She was not pregnant and died of complications related to gallstones. Many still tend to believe the sensationalized story, thinking that there may have been a cover up associated by the church. Regardless, sightings and reports of a young girl’s ghost walking through the graveyard are common. It is said that this spirit is in search of her lost baby. Cross in front of the former old church and reformatory’s hill. The spirit of the so-called deranged priest who was said to have raped Ruby also has claimed sightings. This is thought to be a malevolent entity but also has obvious controversial origins. What is known is that multiple priests who lived in the premises passed away suddenly, yet naturally. Although, there is no substantiated evidence to suggest they have taken up residence in the area as ghosts. Leaning headstone in the St. Johns Cemetery of Kapunda, South Australia. 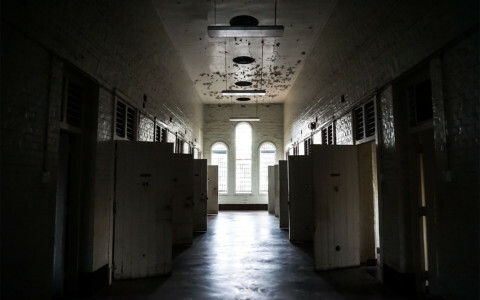 More, exaggerated stories of suicide and mistreatment within the reformatory have been spread. The truth is that no girls ever died whilst in care at the reformatory. Rumors of mistreatment probably stemmed from the fact that two of the reformatories rooms were converted into prison-like cells. This was necessary as many of the girls attempted and pulled off successful escapes. The legend of Vera has spawned from such stories. Vera is supposedly the ghost of a mistreated girl who spent time at the reformatory and is buried within St. Johns Cemetery. She is said to rise from her grave, holding a candle lit lantern and walk the grounds of the cemetery after dark, slowly wandering up the overlooking hill where the reformatory once stood. The name ‘Vera’ was rumored to have been etched into the walls of the now demolished reformatory and has been recently sighted traced into the dirt of the cemetery’s ground. Moonlit St. Johns Cemetery in Kapunda. 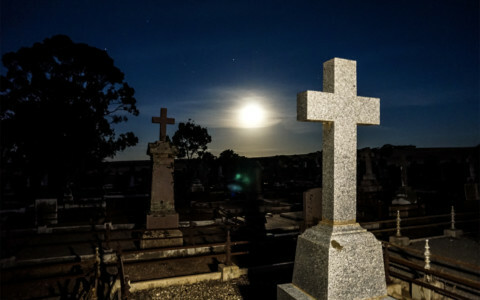 More strange paranormal claims have come out of Kapunda’s St. Johns Cemetery. These include phantom footsteps, the sensations of feeling a nearby presence and hearing disembodied babies crying especially along the fence-line, where many marked and unmarked baby graves exist. You can find the baby memorial by turning right immediately after entering the cemetery through the main gates, and following the fence line. Marker for babies graves in St. Johns Cemetery. The St. Johns Cemetery is poised to remain a site of high traffic from paranormal enthusiasts and thrill seekers for years to come. 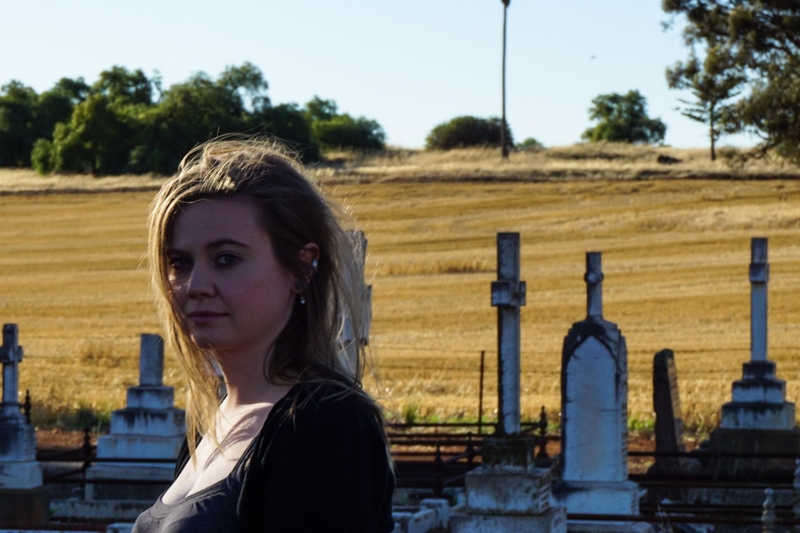 The Cemetery itself is a beautifully grim preservation of Kapunda’s past. To get to the cemetery, you will need to drive down a dirt road, but nothing too extreme. You can park directly outside the gates of the cemetery. Here are the GPS Coordinates. Visitors to the cemetery should also check out other haunts within the town, such as the Courthouse, Jail and the North Kapunda Hotel. 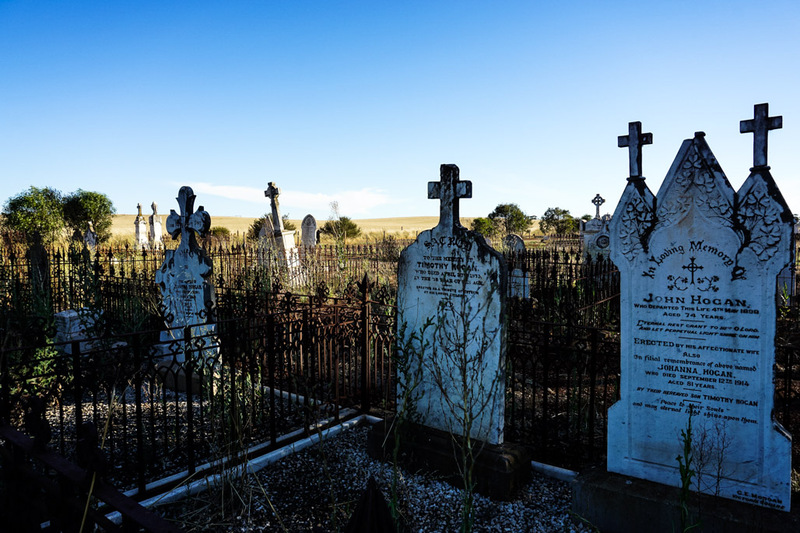 The many graves of Kapunda’s St. Johns Cemetery. Unfortunately, due to a sensationalized false past, St. Johns Cemetery has fallen into disrepair. Sadly, many of the graves have been broken and vandalized. While I encourage visitors to this area, I like to hope that respect will be shown to the structures here. It is promising to note that a local tour group, Ghost Crime Tours, has been working towards preserving and restoring the cemetery since 2014. 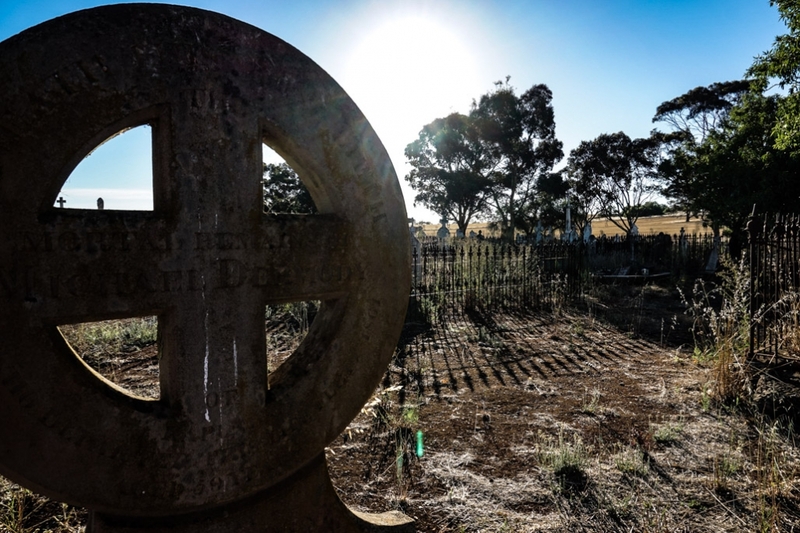 Sun shining on South Australia’s St. Johns Cemetery. The Cemetery is located on St Johns Road (not to be confused with the General Cemetery located on Tarlee Road). The cemetery is a lovely place to visit, go to the north Kapunda pub for a great meal, staff are very friendly. Agreed, the pub is also another great spot to visit. 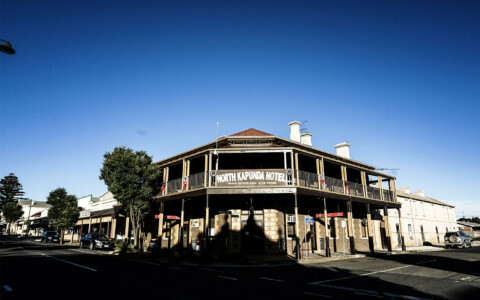 I have also written a blog about that as well, Is The North Kapunda Hotel Australia’s Most Haunted Pub? I’m puzzled – you claim ghosts haunt where they lived, where they died, where they were killed AND where they were buried? Or even where their babies were buried? How does that work? Hey Neil! Thanks for reading my blog and for the comment. Strangely enough, I myself, am a skeptic. I’ve had experiences that I cannot explain, though am looking for answers. Here, on Amy’s Crypt, I blog about supposedly haunted places that I have visited. I carefully research each location’s history and love to share the many ghost stories I discover. I’ve learnt many differences and similarities between ghost stories all across the world among different cultures. Many people theorize spirits could haunt the types of places you have described in your comment. Whether they actually do or not remains a mystery. We couldnt find this St Johns Cemetery last week when visiting Kapunda, the GPS sent us out of town to a farm ….is this where it is….can you just drive in without permission….I want to visit the babies memorial as there is a baby boy Herbert Faul ,he was 5days old, he was my Grandmas brother…..
Hi Donna. Yes it is tricky to find, and it does lay outside of town. You will have to drive down a dirt road to get there, however, it is not that extreme (we drove on it in a small car). 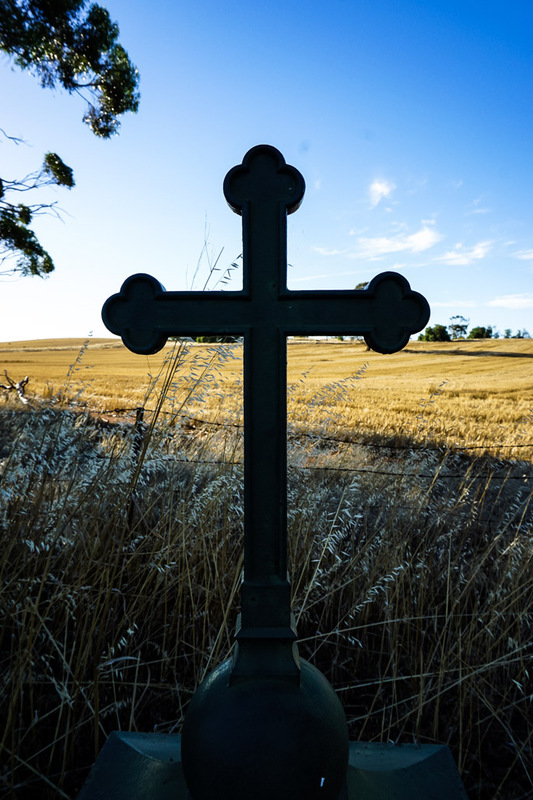 Here is a link to the exact coordinates of St John Cemetery Kapunda on Google Maps. Best way to get there in my opinion is to drive away from the town on Truro Road, and turn right on to St Johns Road. 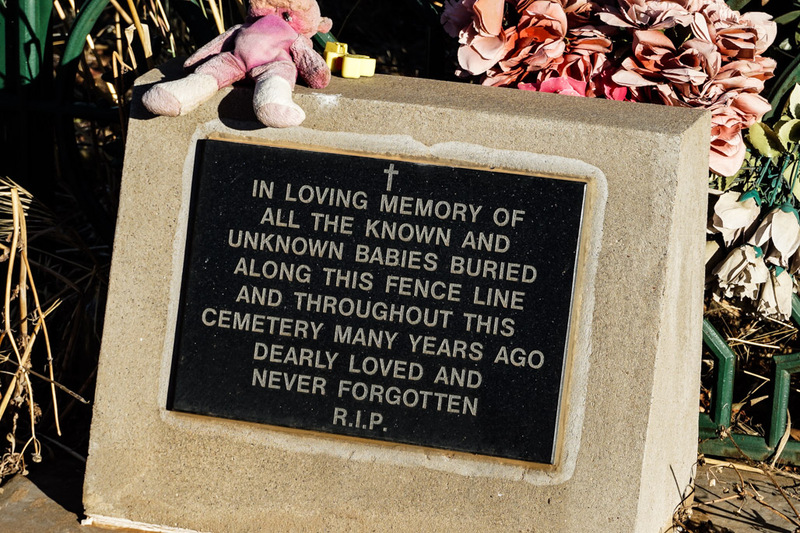 Once you enter the main gates of the cemetery, turn right and follow the fence and you will find the baby memorial. You cannot drive in the cemetery, but you can park on the side of the road just outside the gate. Best of luck finding it. Thanks for the question.